Namibia is a country of startling contrasts that straddles two great deserts: the Namib (for which the country is named) being the oldest desert on the planet, with red dunes towering 1,000 feet high, lording over the Atlantic coast, and the Kalahari, a vast and sparsely vegetated savannah in the east that sprawls across the border into neighboring countries. This safari, in Namibia’s unique desert environment, will take us through remote coastal and inland areas that are rarely explored by others, for an unforgettable journey of discovery. Desert Dune Safari is operated in partnership with Wilderness Safaris, and will be shared with up to 7 guests and a Wilderness Safaris guide. The safari begins with an exploration of Sossusvlei’s iconic red dunes. A scenic flight up the coast then brings us to amazing marine life in coastal Swakopmund. North of Swakopmund, the Skeleton Coast—littered with historic remnants of shipwrecks—is ours to explore, virtually alone. Next, the rugged, rocky landscape of Palmwag invites us to search for some of the last free-roaming black rhino. Finally, three nights of exploring the famous Etosha National Park from a private reserve will top off the adventure with epic wildlife encounters. Aside from wildlife and activities, we will encounter the native people of Namibia, both at the safari camps, and while meeting local people, from fishermen to traditional craft artisans. 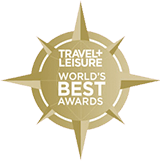 Why Trust Your Safari in Namibia to Boundless Journeys? To develop a collection of truly unique safaris, Boundless Journeys has partnered with some of the best safari outfitters in Southern and Eastern Africa. In addition to experienced guides, first-class vehicles, and a diverse selection of camp and lodge options, our partners’ conservation efforts and community-mindedness are great matches for Boundless Journeys’ core philosophy. 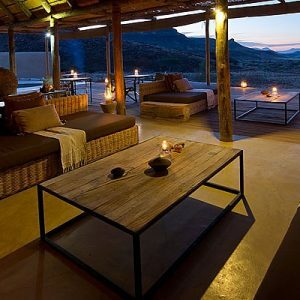 Spend evenings under the stars at the Kulala Wilderness Reserve, the closest point of access to the iconic red sand dunes of Sossusvlei. Not just land mammals — on our Namibia safari we'll find pelicans, dolphins, seals, whales, and turtles in Walvis Bay Harbour, and flamingos at the Kuiseb River Delta. 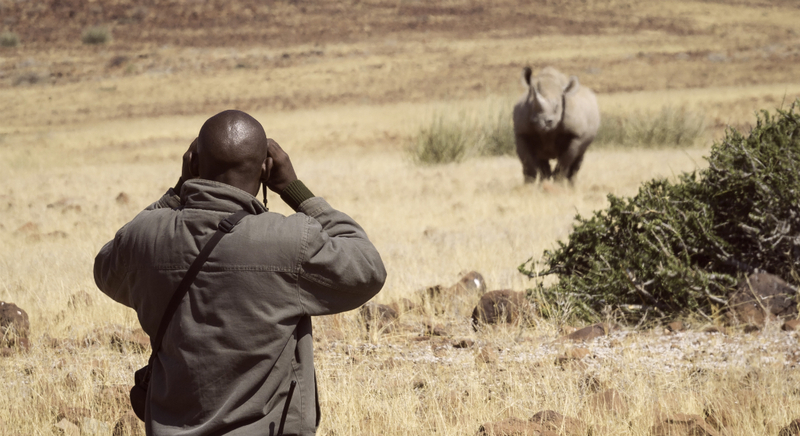 We have the unique privilege of joining Save the Rhino trackers on game drives and tracking the endangered desert-adapted black rhino on foot. Discover desert-adapted wildlife in remote wilderness areas. Etosha boasts the highest density of wildlife in Namibia, and we explore both Etosha National Park as well as adjacent private Ongava Game Reserve on game drives and walking safaris. 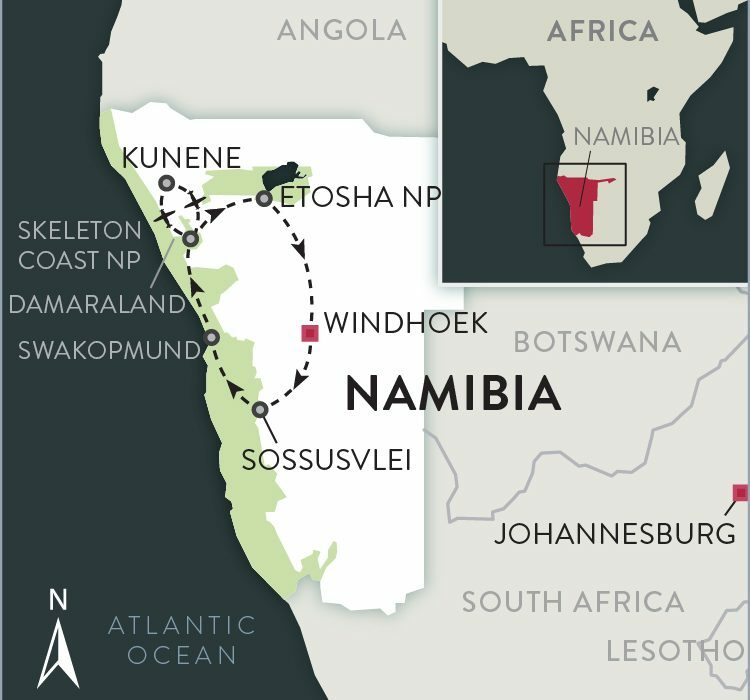 This morning, we gather as a group and depart Windhoek, beginning our journey with a scenic drive through the rugged Khomas Hochland mountains and descending into the dune-filled Sossusvlei region, a driving time of approximately five to six hours (about 200 miles). En route, we stop at a scenic spot for lunch. Soon we find ourselves surrounded by the classic view of the Namib Desert as an ocean of sand, with ''waves'' of bright red and dark shadows. Also known as the 'Sand Sea,' Sossusvlei is sandwiched between the Atlantic''s cold Benguela Current and a rocky escarpment that runs parallel more than 60 miles inland, and presents not only a spectacular visual experience, but also a unique ecosystem which our guide will introduce us to in the coming days. This afternoon, we settle into our accommodation for the next two nights, a 23-room retreat on the private 37,000 hectare Kulala Wilderness Reserve. Our lodge's convivial main area includes a lounge, bar, dining area, plunge pool, and wrap-around veranda overlooking a riverbed - a perfect location to view and photograph the desert vista and to contemplate the day's activities. 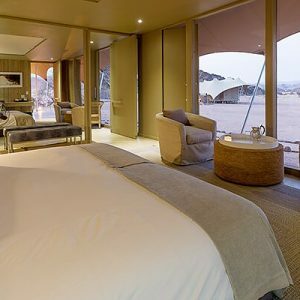 Featuring magnificent views of the famous red dunes of Sossusvlei and vast open plains, Kulala Desert Lodge offers 23 ensuite thatch-and-canvas ‘kulalas’ each with a veranda to enjoy the outstanding scenery. On balmy nights, enjoy the option of sleeping under the star-filled skies on your rooftop deck, and awaken to the rising sun. By day, enjoy safari activities or spot desert-adapted wildlife from the lounge and dining area overlooking a waterhole, while a plunge pool provides a cooling sanctuary. After an early breakfast, we depart camp for the interior of Sossusvlei, where towering dunes rise dramatically, some more than 1,000 feet above the surrounding plains. We plan our activities for early morning to enjoy the fine weather before the day gets too warm. This morning, perhaps you'll choose to challenge yourself to climb to the peak of "Big Daddy" the highest of the famous red dunes, for epic views across the sea of sand. Or perhaps you simply enjoy photographing the native wildlife and stunning landscapes in the beautiful morning light. Desert-adapted wildlife such as ostrich, springbok and gemsbok eke out a carefully balanced existence here. Larger predators include hyena, the almost mystical shaggy-coated scavenger. One bird, the aptly named Dune Lark, has its entire global distribution limited to this region, so dependent is it on the area's characteristic sands. We'll also explore the moon-like landscape of Dead Vlei today, a clay pan characterized by the haunting remains of ancient camelthorn trees contrasted against the white pan floor. The flat pan was formed when the Tsauchab River flooded and an abundance of water allowed camelthorn trees to grow here. However, shifting dunes blocked the river from reaching the area, resulting in the dead trees, estimated to be approximately 900 years old, which have not decomposed due to the extremely dry climate. This evening we'll find ourselves again enjoying life at our lodge. Each free-standing room has a rooftop deck, providing the option of a memorable sleep-out under the stars. We say goodbye to Sossusvlei this morning, departing camp early and driving through the snaking roads of the Kuiseb Canyon and out onto expansive gravel plains, eventually arriving in Walvis Bay before continuing north into the quaint coastal town of Swakopmund, a drive of about 5 - 6 hours (approximately 230 miles). We arrive in Swakopmund, and settle in to our accommodations for the next two nights, an iconic hotel typifying the town's architecture. This afternoon you are free for lunch and time to explore town. 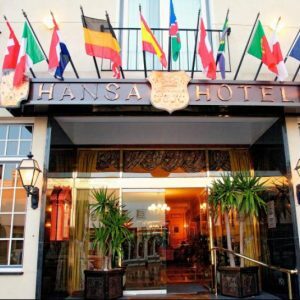 Century-old colonial charm permeates the landmark Hansa Hotel, centrally located in the seaside outpost of Swakopmund. Providing up-to-date service and comfort, bedrooms are spacious and tastefully appointed, with a blend of modern luxury and antique décor, with the sites of Swakopmund only steps away. 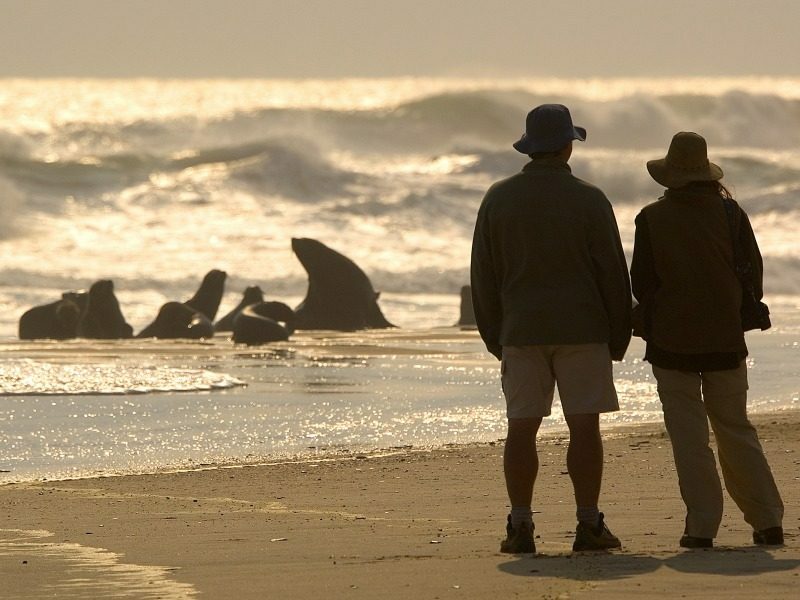 After breakfast, we depart for our marine cruise, exploring Walvis Bay Harbour and old shipwrecks, along with the chance of spotting pelicans, dolphins, seals, and even whales and turtles in season. Our initial route takes us past oyster farms as we approach Pelican Point with its landmark lighthouse and 60,000 resident cape fur seals. In season (July to November), larger mammals such as the Southern right whale and humpback whales are often spotted, while other whale species, such as the gray whale and the pygmy right whale have also made appearances. Bottlenose, heaviside and dusky dolphins are regularly seen, as are mola molas and leatherback turtles. Accompanying our catamarans throughout are a variety of seabirds, such as the Kelp Gull, Hartlaub's Gull, Pelicans and Cape Cormorant. We arrive back to Walvis Bay in the early afternoon, and have the remainder of the day at leisure to explore Swakopmund. Your guide will be happy to make suggestions for dinner. This morning we depart Swakopmund to continue our journey north for approximately 175 miles, partly up the legendary Skeleton Coast (named for the numerous ships the treacherous shores have claimed over the years). We then depart from the coast and drive back roads through the productive Ugab riverbed where we may encounter wildlife, and travel north past Brandberg Mountain - the second largest monolith on earth after Ayers Rock in Australia - to Damaraland. A land of stark beauty, the Damaraland area boasts a varied assortment of desert-adapted wildlife and incredible geological formations. We take our time and spend the day absorbing the scenery and pausing to observe any wildlife we may encounter, and enjoy a picnic lunch en route. By late afternoon we arrive to our home for the night, Damaraland Camp. The result of an inspirational community partnership, Damaraland Camp offers sensational views of desert plains, ancient valleys, and distant mountains. One of the driest regions in all of Africa, the area boasts an assortment of desert-adapted species, including rare desert-adapted elephant and black rhino. The eco-friendly camp is comprised of 10 thatched ensuite tents and a spacious living area complete with a fireplace, bar, and swimming pool. 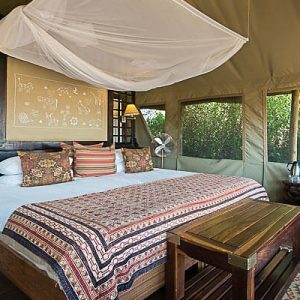 An outdoor ‘boma’ allows for superb stargazing. An exciting day of overland travel to Desert Rhino Camp through the rugged, rocky and mountainous Palmwag Concession brings with it the opportunity of seeing giraffe, oryx and springbok. Our home for the next two nights is known for its growing population of the endangered desert-adapted black rhino (the largest concentration in the world outside a national park), which are monitored and protected by the Save the Rhino Trust. For the next two days, we'll plan to set out in the morning in game drive vehicles, behind the Save the Rhino trackers, who keep records on where and when rhino have recently been seen. Due to the vast terrain, we may cover a considerable distance to view them. Once we have located the rhino, we may be able to track on foot - depending on the position or location of the rhino, as terrain and prevailing winds will dictate the possibilities. Birding and guided nature walks are also a highlight here, and other species we may encounter include elephant, zebra, gemsbok, cheetah, lion, giraffe, and ostrich, among others. This morning we drive to Doro Nawas airstrip for our light aircraft transfer to Hoanib Skeleton Coast Camp. We arrive at our home for the next two nights, immersed in land of rugged scenery. 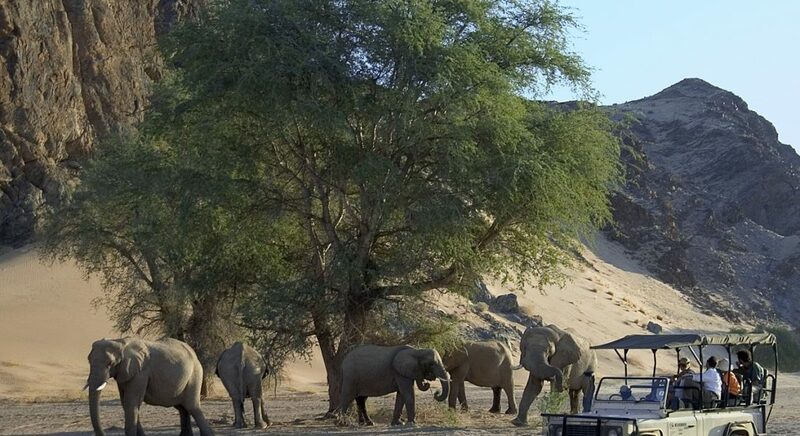 Hoanib Skeleton Coast Camp's location is home to a rich diversity of wildlife, boasting the Kaokoveld's best viewing of desert-adapted wildlife and access to vast and isolated wilderness. 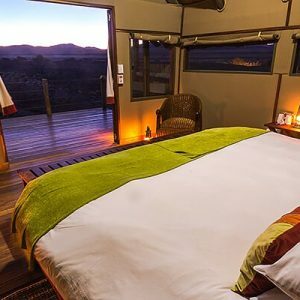 This remote part of Namibia is inhabited by plant and animal life that has adapted superbly to the harsh environment of mountains, vast plains, dunes and dry riverbeds, and the coming days will be spent exploring the vast wilderness around our camp. 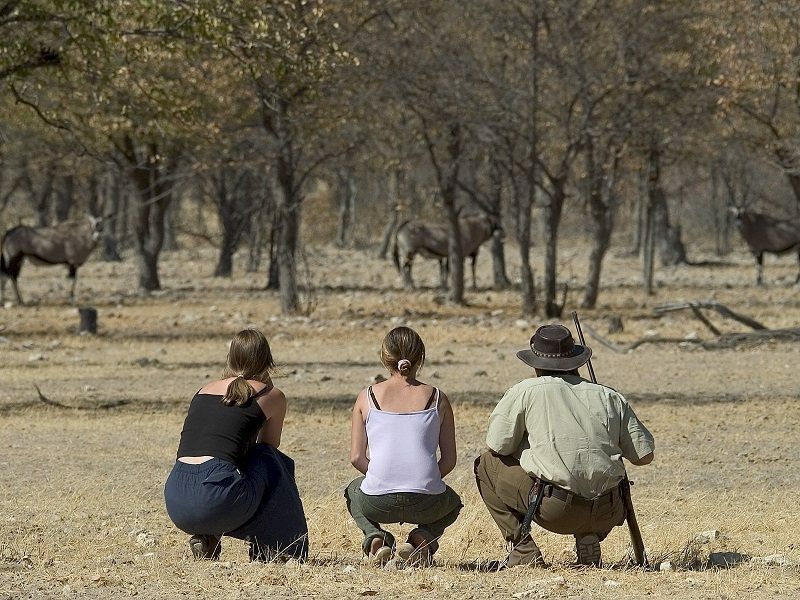 While game drives offer our best chances of encountering wildlife (including elephant, gemsbok, lion, and giraffe, among others), nature walks from camp are another exciting way to get up close and personal with desert-adapted species. In addition to the possibility of spotting big game, walking also offers a good opportunity to study the smaller creatures and the fascinating plant life found here. Birds are equally diverse, with regular endemics like Rüppell's korhaan, Benguela long-billed lark and lark-like bunting. On our three-night stay we will also have the opportunity to do a full-day excursion out the this remote stretch of the Skeleton Coast. On the full day exursion, we make stops at the Klein Oasis Spring, drive amid towering dunes, visit a seal colony, and explore the coastline, viewing shipwreck remains along the way. Typically this involves leaving camp early in the morning by vehicle, and by flying back to the camp (20 minutes). The starkly beautiful Palmwag Concession forms the inland border of Skeleton Coast National Park. Here Hoanib Skeleton Coast Camp offers a visit to one of the most remote places on Earth. Eight stylish ensuite tents with private outdoor lounges are set against a rugged backdrop of hills at the confluence of two tributaries, providing breathtaking vistas. A small plunge pool and a cozy lounge provide comfort during the heat of the day or when the Atlantic fog moves over the plain. We fly to Doro Nawas airstrip this morning before driving to Ongava Game Reserve on the boundary of Etosha National Park. Etosha is justly famous for being the highest density wildlife area in Namibia. 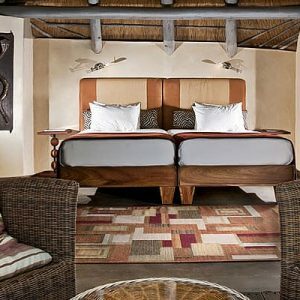 Our three night stay on the private Ongava Game Reserve will allow us time to explore all that Etosha National Park and the Ongava reserve have to offer. Located in northern Namibia, Etosha National Park is a contrasting landscape of woodlands, acacia-strewn plains, and grasslands. But its most defining characteristic is the Pan: over 2,400 square miles of a parched, white salt pan that can even be seen from space. While there is very little vegetation here, fringing the Pan are a number of waterholes that support over 150 mammal species, including lion, elephant, and huge herds of zebra, giraffe, wildebeest, and springbok, as well as rare and endangered species such as the black rhino, tsessebe, gemsbok, and black-faced impala. Our days exploring this area will include game drives both in the park and in the adjacent private concession where we can explore in relative solitude, and may also include nature and wildlife tracking walks. Ongava Lodge is situated along the southern boundary of Etosha National Park in the stunning landscape of Ongava Game Reserve. Small and personal, Ongava overlooks a natural waterhole frequented by an amazing array of wildlife. The lodge offers 13 beautifully appointed chalets and one family room, made of brick, stone, and thatch. Each air-conditioned, ensuite room has glass doors and a private veranda overlooking the plains. Activities include game drives, hide visits, and walks with armed guides. Driving 260 miles south, we return to Windhoek by 1 p.m. and bid farewell to our adventure. Pricing is based on exchange rate of $1 USD to 14 Namibian Dollars. Should the exchange rate fluctuate more than 5%, Boundless Journeys reserves the right to adjust pricing accordingly. Boundless Journeys' trips are designed for energetic and flexible individuals who like to be active and have a spirit of adventure and a positive attitude. Desert Dune Safari is rated 1+, easy with moderate options, on a scale of 1-5 (with 5 being the most strenuous). Our primary activities require some agility for getting in and out of vehicles, and walking at a leisurely pace through uneven terrain, including an optional hike on a sand dune that may be moderately strenuous. This trip can be enjoyed by anyone who is in reasonably good health and likes to be outdoors and active. We will walk where possible, but this is often determined by the local area and country regulations. NOTE: These optional walks are at your own risk, and can take you close to potentially dangerous wild animals in some areas. Windhoek, Namibia, by 10:00 a.m.
No later than 10:00 a.m., Hosea Kutako International Airport, Windhoek, Namibia. If arriving on Day 1, please schedule the earliest possible arrival, but in any case no later than 10 a.m.
1:00 p.m., Hosea Kutako International Airport, Windhoek, Namibia. Please leave a minimum of two hours before your international departure, i.e. no earlier than 3 p.m.
Namibia is one of the driest countries on Earth and receives virtually no rainfall from April-November. Mornings along the coast are typically foggy until the sun burns through. In June, the landscapes tend to be a bit greener and the air quality is extremely clear with very little dust. As the dry season progresses, the vegetation is less green and animals tend to congregate around remaining sources of water. Inland temperatures are typically higher during the day, and cooler at night, than those shown here, and can even drop below freezing overnight. You may obtain other regional weather information on www.weatherbase.com. Namibia is a true year-round destination with less extreme seasonal changes than other parts of southern Africa. Along the Namibian coastline, the cold Atlantic Benguela Current dictates the weather. The Skeleton Coast and coastal towns such as Swakopmund and Walvis Bay are often enveloped in moody fog for a few hours in the mornings, before the sun burns it off. Namibia is equally about the scenic grandeur of immense landscapes as the wildlife. In the camps, the food is healthy, varied, and delicious, a feat when considering the logistics involved in servicing these remote areas with fresh fruits, vegetables, baked goods, and meats. To accommodate the typical morning and late afternoon activity schedule, several small meals and a few large ones are served daily. The pre-activity early breakfast typically includes porridge, cereals, yogurt, fruit, coffee and tea; brunch includes typical breakfast fare accompanied by more savory items like sausage tarts, spring rolls, light lasagnas, and other eclectic choices; afternoon tea offers cakes, cookies, and savory items; "sundowners" are light appetizers and cocktails often enjoyed at a scenic spot; and finally, dinner, ordered from a menu with two or three daily choices. Beef, pork, and chicken are the basis of most main dishes, with occasional opportunities to try indigenous meats like farm-raised springbok. German colonial influence can still be seen in the meals in places like Swakopmund and Windhoek especially. Festus grew up in a Kalahari Desert village in eastern Namibia. Raised in the bush, he tended his family’s free-ranging cattle herds and absorbed much of his superb bush knowledge by growing up with Kalahari Bushmen. After completing secondary school, Festus spent time as an OvaHimba translator on safari trips. 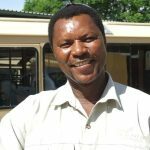 His natural field guide talents soon became apparent, and he was promoted to a guiding position at Ongava Game Lodge near Etosha National Park where he guided for four years before becoming a specialist guide to lead trips in other parts of Namibia. Over the years, he has built up an exemplary reputation and is one of the most sought-after safari guides in Namibia. His profound knowledge and passion for Namibia and its people will be a highlight of your experience. Game driving over bumpy terrain, easy to moderate walks (one moderately challenging option).